Murugappan is 24 years old. He has had health problems since he was 10 months old. We had been treating it. We thought it was wheezing cough all these years, until it kept getting worse, and a tumor showed up on his chest. My son has been diagnosed with cancer. He is determined to beat it but I’m afraid that we will let him down because of our financial situation. 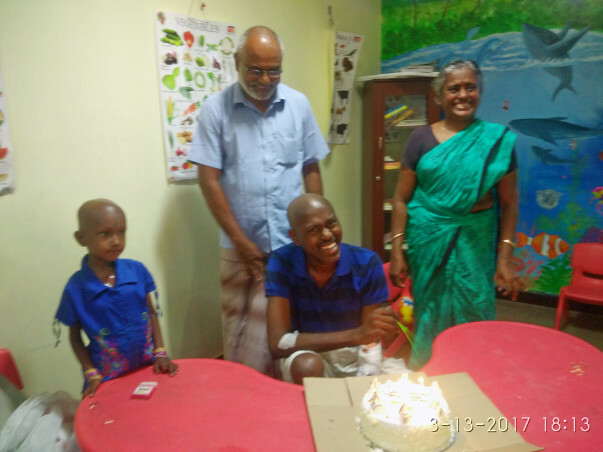 When he was around 10 months old, Murugappan had epileptic seizures. The doctor had told us to watch over him carefully until he was 12 years old, and make sure he does not cry. He had developed wheezing cough as well. We hoped he would eventually grow out of it. He did. After graduation, he joined a factory where the environment gave him an infection. The cough was back. It got worse, and he even went to the doctor for a nebulization treatment. He was 22. Regardless of what problem Murugappan has faced, he is the kind of person who would bear the pain and keep going. He would go by himself to the doctor and get medicines. So we would hardly ever know if he got sick. Last year, he could not bear the problem. He would keep coughing and he had unbearable chest pain. We went to a GP at first who gave medicines and it did not help. When the tumor showed up we ended up at JIPMER for cancer treatment. Although he was getting better, he had a relapse now. My name is Arumugam. My wife Alamelu and I have dedicated our lives to our children Jaya and Murugappan. Jaya is married now. Murugappan was going to work, and he had to quit because this disease broke him physically. At 55, I could only get a job as a part-time chemist for Rs. 5000/month. 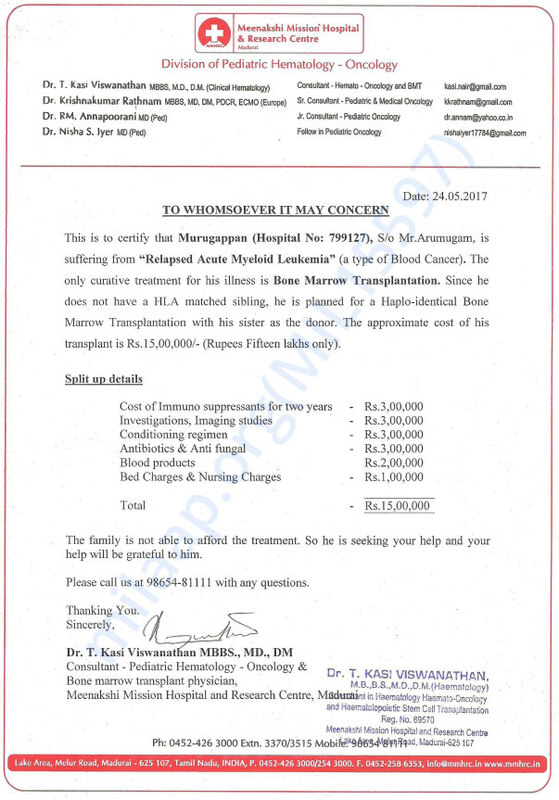 It is not enough to run this family and manage his medical expenses. I have some good friends who regardless of their financial position, are helping me with the expenses. I feel bad asking my relatives for money. They cannot help as much either. Chemotherapy did not cure him. He needs a bone marrow transplant and we cannot afford it. Murugappan is struggling to breathe at times. The chemotherapy has terrible side effects. He has vomiting, dysentery, blisters in his mouth, hair loss, fatigue, problem with appetite and more. Yet, he is strong-willed. He tries to smile and comfort us. He says he will conquer this disease and work twice as hard to achieve the dreams he had been nurturing since he was a little boy. I need your help to give my son that life he truly deserves. It cannot end here. He has so much more to do. We have some unfortunate new to share. 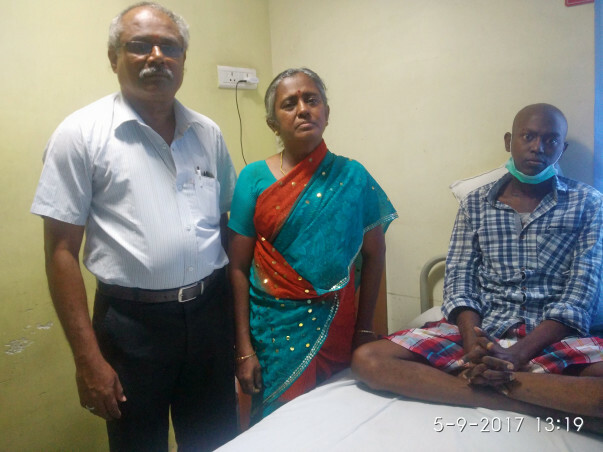 Murugappan was diagnosed to have Acute Myeloid Leukemia in June 2016 in Jipmer with t (8 ;21) positive and FLT3 Negative. He got relapse on Jan 2017 with LS spine sarcoma and Bone Marrow relapse. He received reinduction chemotherapy and attained complete hematological remission. Following which consolidation chemotherapy and radiation to extramedullary sites were given. In view of high risk AML he underwent allogenic full HLA matched sibling peripheral blood hematopoietic stem cell Transplantation in June 2017. He had relapsed disease in october 2017. 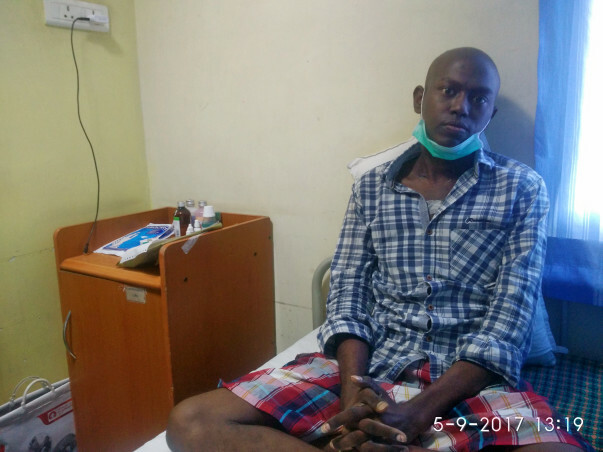 He failed to attain remission with iv decitabine and hence since then he is on supportive care. Parents were explained about the refractory disease status and hence poor prognosis. The funds raised for his campaign has been utilized for his medical expenses. Thank you for all the love support and blessings that you have shown Murugappan. He is doing good now. His bone marrow transplant has been performed. There have been no side effects so far. There is a test scheduled in about a week whose results will tell the success of the transplant procedure. Will keep you posted about the same. Thank you once again for the support. Would request you to please pray for his recovery. I pray to almighty for your speedy recovery and good health.